Bryan Stepanenko and Norm Engel made a lifelong connection that started 25 years ago when Bryan was just 4 and living with leukemia. The duo met again recently to celebrate another milestone. It all started at the Make-a-Wish Foundation in 1989. Bryan had one wish — to go to Disney World. 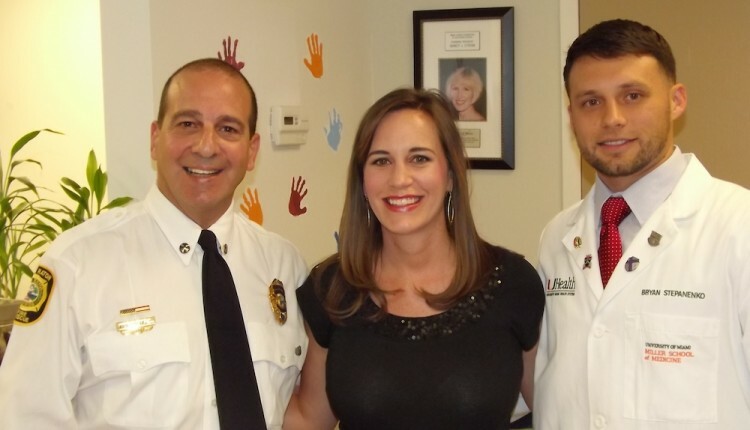 Engel, a firefighter, granted that wish and made quite an impact on the young man. “As soon as we opened the door, this little wild man is running around, all smiles. You’d never know the kid was sick,” Engel said of meeting Bryan. Two decades later, a letter from Bryan’s dad made its way to Engel at his fire station. When Bryan was ready to graduate, Engel was there again with another once-in-a-lifetime surprise: he was going to pin Bryan with his newly earned badge. “I started reading a speech I made, which I thought I’d be able to get through. It was tough. There really wasn’t a dry eye in the house, including us,” Engel said. Bryan is not only trying to help others by working as a firefighter/paramedic, he’s also working on become a doctor and has one year left of med school. He’s also working on becoming a volunteer with the Make-A-Wish foundation. Stories like that are why wishes matter. I’m emceeing “Walk for Wishes” in Miami at Jungle Island on the morning of May 3, 2015. The point of this 5K: To turn your steps into wishes. I have created a team named “Miles of Smiles” — cute, huh? If you are in the area and want to walk or run, please join my team. If you are unable to make it, please donate. Any little bit helps. Christina is a happily married mother of two who does it all. She recently left the news business after appearing on air as an TV anchor/reporter. Now, she works in public relations. She is also a blogger, a Younique presenter and a Make A Wish Foundation volunteer.